Royal Pearls ... being developed by Oriental Pearls. Oriental Pearls has chosen the luxury brand Tonino Lamborghini to provide a distinctive look for the apartments at its master-planned community in Dubai’s Meydan One district. Oriental Pearls, a leading real estate developer of upscale urban living spaces, has signed a multi-million-dollar agreement with Tonino Lamborghini, the Italian company dedicated to lifestyle accessories and lavish design hospitality projects, to customise the upcoming Royal Pearls project in Dubai, UAE. Through this partnership, Tonino Lamborghini has granted Oriental Pearls exclusive rights to use the luxury brand in the emirate in the real estate sector for a minimum period of 10 years, says the developer. The exclusive agreement will bring Tonino Lamborghini’s legendary standards of luxury, exclusivity and customisation to the Royal Pearls master-planned community that is currently taking shape in Meydan One district. The 4.6-million-sq-ft development will see over 7,500 premium freehold apartments being offered to residents, with the first phase of 1,565 units being delivered by 2020. When complete, the community will offer residents a full suite of home automation, smart security, and networked facilities management services. 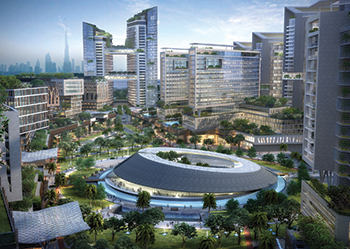 As per the deal, the Italian firm will apply the Tonino Lamborghini branding, philosophy and values across Oriental Pearls’ real estate developments in Dubai. Tonino Lamborghini is the sole owner of the internationally registered “Tonino Lamborghini” trademark of the Italy-based company founded by the heir of the Lamborghini family. By staying true to the tradition and heritage of his family, in 1981 Tonino Lamborghini created a lifestyle experience brand with a wide range of luxury design products to promote a distinctive Italian style and taste. Through the deal, Oriental Pearls says it has also decided to be associated with other Tonino Lamborghini lifestyle accessories in order to deliver a luxury and premium quality real estate concept across its developments. The agreement also grants Oriental Pearls the right to develop and operate, within the Royal Pearls project, Tonino Lamborghini branded clubs, lounges, restaurants, cafés, gyms, spas as well as Tonino Lamborghini flagship or mono-brand stores in the community. These Tonino Lamborghini units can both be designed and furnished with the Tonino Lamborghini Casa design concept and furnishings as per the customer’s requirements, it stated. “This real estate project is especially dedicated to Italian art, design and lifestyle lovers. A clientele that shares our same passions and our same vision. Here they will find spaces and places that will perfectly reflect their personality and make them feel unique and special,” he adds. 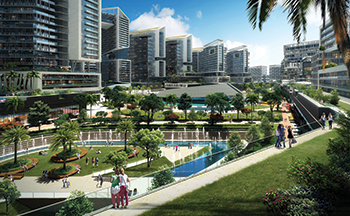 Offering a range of smart, networked living spaces, set in carefully contoured lawns and meticulously manicured swathes of greenery, Royal Pearls will be a unique and ultra-modern community centre, surrounded by water features, and a beautifully landscaped park. Residents and visitors alike will enjoy a wide assortment of state-of-the-art attractions and leisure offerings including cafes, restaurants, a 55-seater private theatre, day care centre, multifunctional hall, spa, salon, bowling alley, squash courts and a massive fitness centre.